“Star anise” redirects here. For other uses, see Star anise (disambiguation). Illicium verum is a medium-sized evergreen tree native to northeast Vietnam and southwest China. A spice commonly called star anise, staranise, star anise seed, Chinese star anise, or badiane that closely resembles anise in flavor is obtained from the star-shaped pericarps of the fruit of I. verum which are harvested just before ripening. Star anise oil is a highly fragrant oil used in cooking, perfumery, soaps, toothpastes, mouthwashes, and skin creams. About 90% of the world’s star anise crop is used for extraction of shikimic acid, a chemical intermediate used in the synthesis of oseltamivir (Tamiflu). Illicium comes from the Latin illicio meaning “entice”. In Persian, star anise is called بادیان bādiyān, hence its French name badiane. Star anise contains anethole, the same compound that gives the unrelated anise its flavor. Recently, star anise has come into use in the West as a less expensive substitute for anise in baking, as well as in liquor production, most distinctively in the production of the liqueur Galliano. Star anise enhances the flavour of meat. It is used as a spice in preparation of biryani and masala chai all over the Indian subcontinent. It is widely used in Chinese cuisine, and in Malay and Indonesian cuisines. It is widely grown for commercial use in China, India, and most other countries in Asia. Star anise is an ingredient of the traditional five-spice powder of Chinese cooking. It is also a major ingredient in the making of phở, a Vietnamese noodle soup. It is also used in the French recipe of mulled wine, called vin chaud (hot wine). If allowed to steep in coffee, it deepens and enriches the flavor. The pods can be used in this manner multiple times by the pot-full or cup, as the ease of extraction of the taste components increases with the permeation of hot water. Star anise is the major source of the chemical compound shikimic acid, a primary precursor in the pharmaceutical synthesis of the antiinfluenza drug, oseltamivir (Tamiflu). An industrial method for the production of shikimic acid using fermentation of E. coli bacteria was discovered in 2005, and applied in the 2009 swine flu outbreak to address Tamiflu shortages, also causing price increases for star anise as a raw material of shikimic acid. As of 2018, fermentation of E. coli was the manufacturing process of choice to produce shikimic acid for synthesis of Tamiflu. Swamp star anise Illicium parviflorum is a similar tree found in the Southern United States, and should not be used for folk remedies or as a cooking ingredient, as it is toxic. Joshi et al. have used fluorescent microscopy and gas chromatography to distinguish the species, while Lederer et al. employed thin layer chromatography with HPLC–MS/MS. ^ “The Plant List: A Working List of All Plant Species”. Retrieved 3 September 2015. ^ “Galliano”. Retrieved 13 March 2016. ^ “Spaghetti Bolognese”. In Search of Perfection. BBC Two. ^ a b Bilal, Muhammad; Wang, Songwei; Iqbal, Hafiz M. N.; Zhao, Yuping; Hu, Hongbo; Wang, Wei; Zhang, Xuehong (16 July 2018). “Metabolic engineering strategies for enhanced shikimate biosynthesis: current scenario and future developments”. Applied Microbiology and Biotechnology. 102 (18): 7759–7773. doi:10.1007/s00253-018-9222-z. ISSN 0175-7598. PMID 30014168. ^ a b “Oseltamivir (Tamiflu): Uses, Dosage, Side Effects”. Drugs.com. 8 May 2018. Retrieved 31 January 2019. ^ Wang, G. W.; Hu, W. T.; Huang, B. K.; Qin, L. P. (2011). “Illicium verum: A review on its botany, traditional use, chemistry and pharmacology”. Journal of Ethnopharmacology. 136 (1): 10–20. doi:10.1016/j.jep.2011.04.051. PMID 21549817. ^ Bradley, D. (Dec 2005). “Star role for bacteria in controlling flu pandemic?”. Nature Reviews Drug Discovery. 4 (12): 945–946. doi:10.1038/nrd1917. ISSN 1474-1776. PMID 16370070. ^ Krämer, M.; Bongaerts, J.; Bovenberg, R.; Kremer, S.; Müller, U.; Orf, S.; Wubbolts, M.; Raeven, L. (2003). “Metabolic engineering for microbial production of shikimic acid”. Metabolic Engineering. 5 (4): 277–283. doi:10.1016/j.ymben.2003.09.001. PMID 14642355. ^ Louisa Lim (18 May 2009). “Swine flu bumps up price of Chinese spice”. US National Public Radio. ^ Perret, C.; Tabin, R.; Marcoz, J.-P.; Llor, J.; Cheseaux, J.-J. (2011). 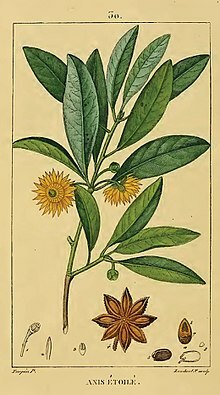 “Malaise du nourrisson pensez à une intoxication à l’anis étoilé” [Apparent life-threatening event in infants: think about star anise intoxication]. Archives de Pédiatrie. 18 (7): 750–753. doi:10.1016/j.arcped.2011.03.024. PMID 21652187. ^ “How to Grow Star Anise”. 2015-10-28. ^ International Organization for Standardization. “ISO 676:1995 Spices and condiments — Botanical nomenclature”. Retrieved 8 June 2009. ^ Joshi, Vaishali C.; Ragone, S; Bruck, IS; Bernstein, JN; Duchowny, M; Peña, BM (2005). “Rapid and easy identification of Illicium verum Hook. f. and its adulterant Illicium anisatum Linn. by fluorescent microscopy and gas chromatography”. Journal of AOAC International. 88 (3): 703–706. PMID 16001842. Retrieved 10 November 2007. ^ Lederer, Ines; Schulzki, G; Gross, J; Steffen, JP (2006). “Combination of TLC and HPLC-MS/MS methods. Approach to a rational quality control of Chinese star anise”. Journal of Agricultural and Food Chemistry. 54 (6): 1970–1974. doi:10.1021/jf058156b. PMID 16536563. ^ International Organization for Standardization. 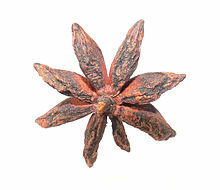 “ISO 11178:1995 Star anise (Illicium verum Hook. f.) — Specification”. Retrieved 8 June 2009.